Pastors: H.A. Preus 1852-1856; A.C. Preus 1952-1856; P.M. Brodahl 1856-1868; A. Jacobson 1868-1878; A. Bredeson 1876-1881? ; P. Isberg 1881-1883; O.B. Syftestad 1883-1890; A. Jacobson 1890; S. Gunderson 1890-1947; H. Gunderson 1930-19? ; O. Solberg 1931? 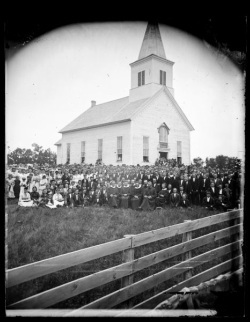 Notes: The first services Blue Mounds actually had were held in July, 1850, on the Sobjorn Dusterud farm. 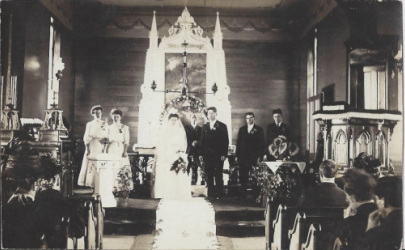 The second service in Blue Mounds was at the Thore Maanum farm. On Wednesday, December 1, 1852, a meeting was held in the log school house, later the Lukken School. The first and only church building was built in 1868. 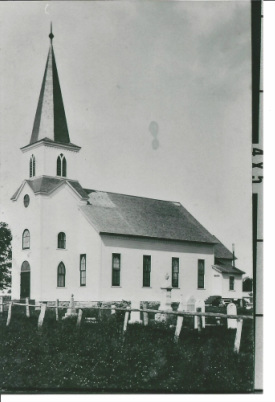 The original small steeple was replaced in 1907 when a new entrance hall and steeple were constructed. In 1880 a thousand pound bell was acquired and for a while it sat on the ground next to the building until it was installed in the old steeple and transferred to the new. 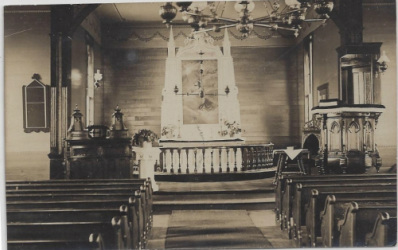 In 1943 the interior of the church was redecorated. During this redecoration an early wall mural that featured rosemaling, a Norwegian form of decoration, was covered over and rediscovered when the church building was taken down. It is believed to be the decoration that was on the wall that was placed there before and actual alter was installed. It is now in the collections of the Mount Horeb Area Historical Society. The wooden alter of the church was created by Aslak O. Lie, a Norwegian cabinet maker of Klevenville. In 1948 the women of the church were given the right to vote in church business. Men with plow along Barton Rd.